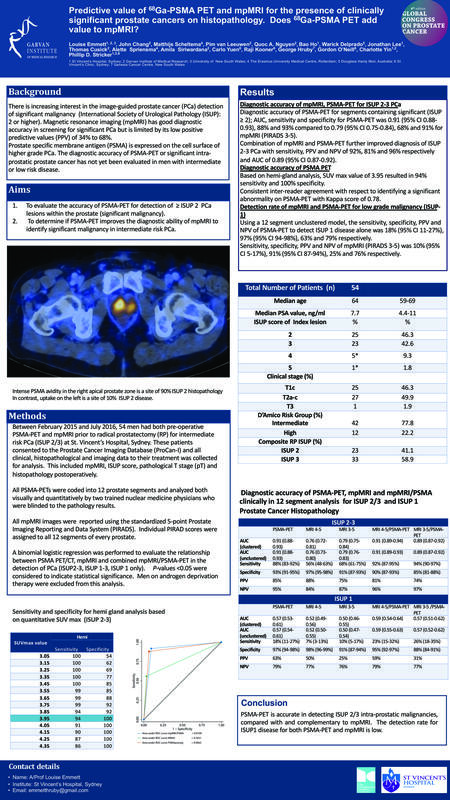 Objective: To evaluate the ability of PSMA to detect significant intra-prostatic malignancy in an intermediate grade PCa (ISUP 2/3) cohort, and determine if PSMA improves diagnostic accuracy of mpMRI. Patients and Methods: 56 consecutive patients with ISUP 2/3 PCa on radical prostatectomy histopathology (RP), with mpMRI and PSMA PET CT were enrolled. Accuracy of PSMA, mpMRI and in combination was analyzed for identifying ISUP 1-3 within a 12 segment model. Accuracy of a combined predictive model (PSMA & mpMRI) was determined. An optimised quantitative cut-off for PSMA was assessed for maximum standardized uptake value (SUV max). Results: On per patient basis, identifying ISUP 2-3 PCa, sensitivity for PSMA and mpMRI were 100% and 97% respectively. Assessing ³ISUP 2 using a 12 segment analysis, PSMA PET demonstrated greater sensitivity, specificity, NPV and PPV of 88%, 93%, 95% and 85% than mpMRI (PIRADS 3-5) 68%, 91%, 87%, 75% respectively. Sensitivity for both modalities reduced when assessing ISUP 1, PSMA 18% and mpMRI 10%. When used in combination (PSMA & mpMRI PIRADS 4-5), sensitivity and NPV was 92% and 96% respectively. With hemi gland analysis an SUVmax value of 3.95 achieved a sensitivity and specificity of 94% and 100% for detecting ³ISUP 2. Conclusion: PSMA is accurate in detecting ISUP 2/3 intra-prostatic malignancies, compared with and complementary to mpMRI. The detection rate for ISUP 1 disease is low.